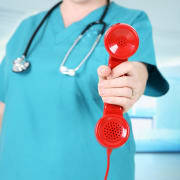 The Alacare Hospice Volunteer Services Program can put your telephone talents to good use! We are searching for someone who has the ability, and the heart, to help the local office make weekly calls to all our hospice patients and/or their caregivers. You may call from the comfort of your own home. Every Thursday, around mid-morning, a Telephone Support Volunteers calls our Hospice patients and/or caregivers to ensure they have enough supplies for the weekend. In addition, when there is a weather emergency, our volunteers may call some patients and/or caregivers to ensure their needs are met. Our Telephone Support Volunteers also help make birthday, Christmas, and other special occasion calls! Often our volunteers call to cheer the lonely day of a home-bound patient or care giver.